Ah, nouns. Classically defined as “people, places, and things,”1 these little (and sometimes not so little) words can carry a lot of meaning, encompassing everything from cats to triskaidekaphobia2. Pair them with verbs (those things you do), and you’ve really got something. In English, there’s a comforting solidity to nouns. Not like verbs, that throw on endings and even, le gasp, change vowels like they’re trying on hats. Nouns, now—nouns are dependable. Or so you thought. When you change the form of a verb to reflect who’s doing what and when, that’s called conjugation. Here’s the bombshell: nouns can do that, too. It’s called declension. For regular nouns, English only distinguishes between singular and plural and between possessive and non-possessive. Spanish distinguishes between singular and plural and declines for grammatical gender (e.g. the adjective blanco will become feminine blanca when describing la tortuga blanca ‘the white turtle’). The diversity of their pronoun forms3 is a remnant of their parent languages, Old English and Latin respectively. These older languages had full, healthy case systems that affected all their nouns. They in turn inherited their noun cases from a common ancestor, namely Indo-European (IE). nominative subject amīcus ‘boy’/puella ‘girl’ (Lat) The boy plays. accusative direct object amīcum/puellam He loves the girl. dative indirect object amīcō/puellae He gives the girl a flower. ablative movement away from amīcō/puellā She runs from the boy. vocative addressee amīce/puella Boy, where art thou? locative physical or temporal location domī ‘at home‘ (Lat) She stays at home. instrumental by means of which something is done þȳ stāne ‘with a stone’ (OE) He raps on her window with a stone. This is a rather simplified representation of the situation. The actual distinctions and usages of the cases vary from language to language, particularly because very few IE languages utilize all eight cases (like Sanskrit does). It’s the nature of languages to change, and cases have a propensity to merge, a process called syncretism4. It’s like when you’re working on a group project, and half the group doesn’t show up, leaving the kids who want a good grade to pull double duty and fulfill the delinquents’ obligations as well as their own. For example, in Old English, the dative case fills some of the same uses as the ablative case in Latin because Old English doesn’t have an ablative. The case of noun cases shook out a little differently across the Indo-European language family. As previously mentioned, Sanskrit has eight cases. Latin has seven. Old English has five. Icelandic and German have four (although German doesn’t show it on nouns so much as on articles and adjectives). And languages like English and Spanish don’t so much have cases anymore as much as they have pictures of their old case-infused relatives hanging on their walls. We’ve discussed before (repeatedly) that one language isn’t really harder than any other; they’re just different. The human brain is well equipped to utilize any of them it can get its neurons on. If our homo sapien super computers couldn’t handle a given linguistic structure, it wouldn’t develop. Easy as pie. To Word Order or Not to Word Order? Now, a robust system of noun cases (and verb conjugation) in a language can affect more than just the morphology. Because so much important information is embedded in the words themselves, word order is less important and more flexible than in languages like Modern English. In Old English, ‘Se hlāford lufaþ þā frōwe’ and ‘Þā frōwe lufaþ se hlāford’ both mean ‘The lord loves the lady.’ In Modern English, ‘The lord loves the lady’ and ‘The lady loves the lord’ have very different meanings (although, for the sake of romance, one hopes that both statements are equally true). To say ‘The lady loves the lord’ in Old English, you would decline the nouns differently and say ‘Sēo frōwe lufaþ þone hlāford.’ (Maybe this wasn’t the best example as there aren’t noticeably distinct ending on the verbs, but you can see the difference in case in the demonstratives.) This is not to say that Old English doesn’t have rules about word order, but it’s less crucial than in today’s English. Languages that rely on declension and conjugation (both types of inflection) to convey meaning are called synthetic languages. Languages that rely more on word order are called analytic. These distinctions are not binary but rather are a matter of degree. So, there you have it. (It being a brief rundown on noun cases.) As parts of speech go, nouns are pretty straightforward. But like a duck paddling on water, nature’s got a lot of beautiful stuff going on underneath the surface. 1 Thanks to Schoolhouse Rock. 2 A fear of the number 13. 3 Pronouns generally resist change (the stubborn things), hence the moderate survival of cases where they were generally lost throughout the rest of the language. 4 This phenomenon is propelled by things like sound change. If the endings for two cases start to sound identical, it becomes hard to distinguish them as separate forms. You see the similarities? Now, why is that, you might wonder. Well, because they are related! 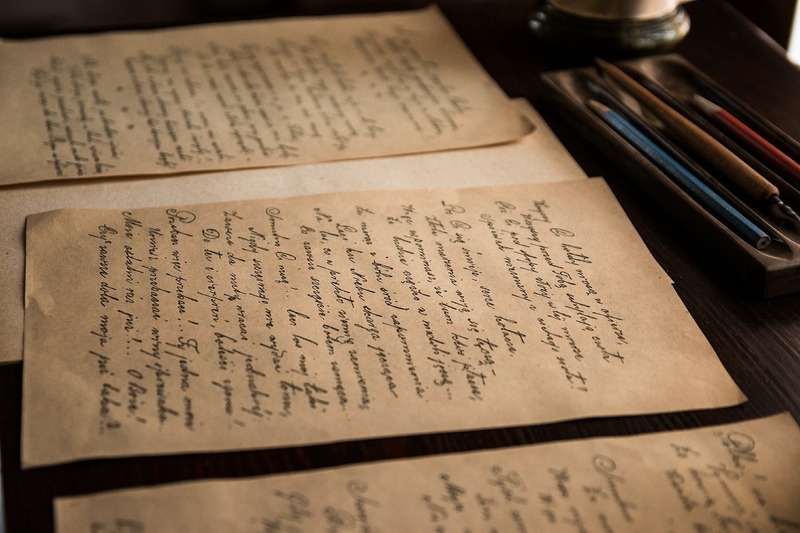 In the linguistic world, related languages are languages that have so much in common that we cannot claim that it is merely due to extensive contact and/or borrowing. These languages, we say, are so similar that there can be no other reasonable explanation than that they descend from a common source: a mother language, as it were. In the case of Spanish and Italian, the mother is Latin, while in the case of Swedish, Danish and Norwegian, the language is Old Norse. Now, it would be convenient if it stopped there, wouldn’t it? But, of course, it doesn’t. Like any family, the mother also has a mother and other relatives, like siblings and cousins. Old Norse, for example, has its own sisters: Old High German, Old Frisian, Old English, etc., which all share the same mother: Proto-Germanic. This is the Germanic language family. Spanish and Italian also have sisters: French, Portuguese, Romanian, etc., and their common mother is Latin. This is the Romance language family, deriving from Vulgar Latin. But, of course, Latin has its own sisters, for example Umbrian and Oscan, and together with its sisters, Latin forms the Italic language family. Does it feel a bit confusing? 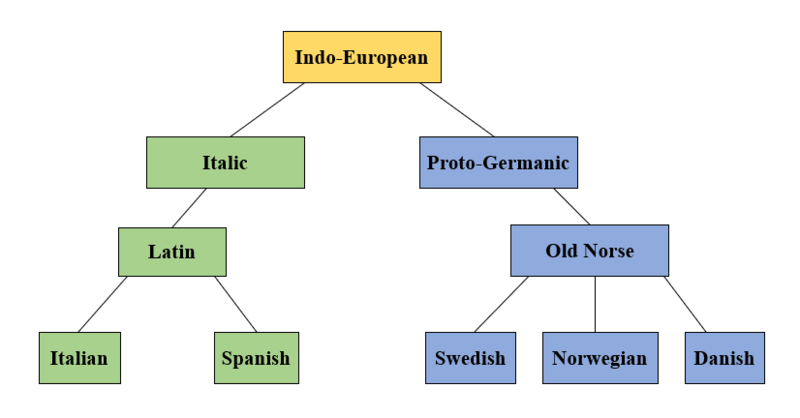 Well, that’s understandable and I’m going to kick it up a notch by adding that the Italic language family, with languages like Spanish and Italian, and the Germanic language family, with languages like Swedish and Danish, actually have the same mother: Proto-Indo-European (or just Indo-European). The mother in this case is veeeery old, and we actually don’t have any kind of evidence of how it looked! Indo-European is a reconstructed language, more commonly known as a proto-language (as you may have noticed, we call the mother of the Germanic family Proto-Germanic, meaning that it is also a reconstructed language). It has never been heard, never been recorded and no one speaks it. Then how the heck do we know anything about it, right? Well, that has to do with something called the comparative method, which we’ll explain in another post. You’re kinda hating me right now, aren’t you? Looking at these words, it is unlikely that you would draw the conclusion that the two languages are related. Looking at the language tree, however, you can see that linguists have concluded they are. Now, you’re probably staring at your screen going “whaaaat?” but, indeed, they are both descendants of Indo-European and are therefore related. While Indo-European is clearly a large group of languages, it is not the only one (or even the largest). Looking a bit closer at the Indo-European language family, you will notice that languages such as Mandarin and Finnish are not included. These belong to other families, in this case the Sino-Tibetan and Finno-Ugric (or Uralic, depending on your definition) language families respectively. So, looking at languages is kinda like looking at your own family tree: every mother will have a mother (or father, if you want, but traditionally, linguists call them mothers and daughters). Some branches will have siblings, cousins, second cousins and so on. Some will look nothing like their relatives (or, well, little anyway) and some will be strikingly similar. That’s just the way families work, right? So, now, we’ve reached a point where I can answer the question in the title: Is English a Romance language? While this is a much-debated question (do a google search and see for yourself), the simple answer is: no, it’s not. At least, not to a linguist. Now, you might be sitting at home, getting more and more confused because a lot of English vocabulary can be traced back to Latin (the word ‘vocabulary’ being one of those words, actually). But when linguists say that a language is a Romance language, we are referring to the relationship illustrated in the tree structure, i.e. the language has Latin as its mother. English, then, despite having borrowed a substantial part of its vocabulary from Latin (and later from the Latin language French), it is not in itself a daughter of Latin. English is a daughter of Proto-Germanic, thus, it is a Germanic language. However, Latin and Proto-Germanic are both daughters of Indo-European. Latin and English are therefore clearly related, but the relationship is more like that of a beloved aunt rather than a mother (if, you know, the beloved aunt refused to recognise you as a person unless you imitated her). At the end of the day, languages are like any other family: some relationships are strong, some are weak, some are close, some are not. Tune in next week when Riccardo will delve into another branch of language families: constructed languages. *The structure employed here, showing languages as families in family trees, has long been criticized for simply not showing a lot of information like contact-situations, dialect continuums and when the languages were spoken. It has, however, been used to show the beginning student that some languages are related to each other and how they are related in a way that is easy and comprehensible. The Historical Linguist Channel does, however, recognise this criticism and would be happy to discuss it in a separate post or through personal communication. 2Lewis, M. Paul (ed. ), 2009. Ethnologue: Languages of the World, Sixteenth edition. Dallas, Texas: SIL International. Online version: http://www.ethnologue.com/16. (Family index is reached through http://www.ethnologue.com/16/family_index/).